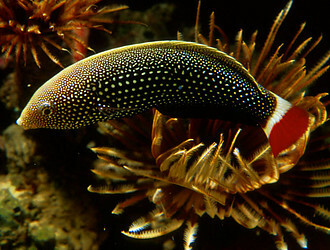 Acanthopterygii comprises three relatively small, sequential, worldwide marine clades, Stephanoberyciformes, Zeiformes, and Beryciformes as well as the largest and most diverse group of fishes, the Percomorpha. Stephanoberyciforms (90 species in nine families) include deepwater benthic and pelagic fishes commonly called pricklefishes and whalefishes. Johnson and Patterson (1993) separated this clade from the Beryciformes, but molecular data suggest that at least some members of the group might rejoin it (e.g., Wiley et al., 2000; Colgan et al., 2000; Chen et al., 2003; Miya et al., 2001, 2003, 2005). Zeiforms (45 species in five families) are mostly deep-bodied, deep-sea fishes that include the highly prized John Dory of the eastern Atlantic and Indo-Pacific. Most molecular studies (e.g., Wiley et al., 2000; Miya et al., 2001, 2003, 2005; Chen et al., 2003) suggest that cods and dories might be related. Beryciforms (145 species in seven families) occur from shallow depths, where they tend to be nocturnal (e.g., the well known reef dwelling squirrelfishes), to the deep sea. 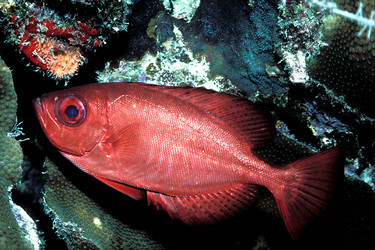 They include the bioluminescent pinecone and flashlight fishes as well as the commercially important and overexploited food fish, the orange roughy. The Percomorpha are the crown group of the spiny-rayed fishes, comprising more than 14,000 species in 244 families. Pelvic fin spine present. A variable character lost in some members of each major group (see discussion in Johnson and Patterson, 1993). Free pelvic radials reduced in size and/or number (Johnson and Patterson, 1993). An anteromedial process (styliform process) present on the pelvic bone (Stiassny and Moore, 1992). A variable character absent in non-melamphaid stephanoberyciforms, zeiforms, some atherinomorphs, and all gasterosteiforms (Johnson and Patterson, 1993). As originally conceived by Greenwood et al. (1966), Acanthopterygii included Percomorpha (tunas, basses, etc.) but excluded Atherinomorpha (killifishes, silversides, etc.). Rosen and Patterson (1969) united these two groups and ranked them co-equal with Paracanthopterygii. Thus, Acanthomorpha contained two major groups, Paracanthopterygii and Acanthopterygii. The period between 1969 and the present has seen changes in the composition of both groups. Rosen (1985) and Stiassny (1986) removed the Polymixiiformes (beardfishes) from Acanthopterygii to the base below Paracanthopterygii, and Stiassny and Moore (1992) suggested that the Lampridiformes (oarfishes and allies) might also be basal. In their new proposal of acanthomorph relationships Johnson and Patterson (1993) corroborated both of these hypotheses and thus redefined the Acanthopterygii, placing Polymixiiformes and Lampridiformes as sequential sister groups to the remaining acanthomorphs (Paracanthopterygii,Acanthopterygii, their Holacanthopterygii). The basal placement of polymixiiforms and lampridiforms has subsequently been supported in DNA studies (e.g., Wiley et al., 2000; Miya et al., 2001, 2003, 2005). However, there has been a growing recognition that the Paracanthopterygii is polyphyletic and the Acanthopterygii paraphyletic. Johnson and Patterson (1993) used only Percopsiformes to represent Paracanthopterygii, assuming the monophyly of the group following Patterson and Rosen (1989). Gill (1997) suggested that the morphological evidence for monophyly of Paracanthopterygii is weak. DNA studies (e.g., Le et al., 1993; Wiley et al. 2000; Miya et al., 2001, 2003, 2005) suggest that Paracanthopterygii is polyphyletic, with Gadiformes and Percopsiformes being basal at the level previously shown for Paracanthopterygii, and Lophiiformes, Batrachoidiformes, and Ophidiiformes embedded within the Acanthopterygii of Johnson and Patterson (1993). Colgan, D. J. C., C. Zhang, and J. R. Paxton. 2000. Phylogenetic investigations of the Stephanoberyciformes and beryciformes, particularly whalefishes (Euteleostei: Cetomimidae), based on partial 12S rDAN and 16s rDNA sequences. Mol. Phylogenet. Evo. 17(1):15-25. Gill, A. C. 1996. Comments on an intercalar path for the glossopharyngeal (Cranial IX) nerve as a synapomorphy of the Paracanthopterygii and on the phylogenetic position of the Gobiesocidae (Teleostei: Acanthomorpha) Copeia 1996(4), 1022-1029. Greenwood, P. H., D. E Rosen, S. H. Weitzman and G. S. Myers. 1966. Phyletic studies of teleostean fishes, with a provisional classification of living forms. Bull. Am. Mus. Nat. Hist. 131:339-456. Johnson, G. D. and C. Patterson. (1993) Percomorph phylogeny: A survey of acanthomorph characters and a new proposal. Bull. Mar. Sci. 52, 554-626. Le, H. L. V., G. Lecointre, and R. Perasso. 1993. A 28S rRNA-based phylogeny of the gnathostomes: first steps in the analysis of conflict and congruence with morphologically based cladograms. Mol. Phylogenet. Evol. 2(1):31-51. Patterson, C., and D. E. Rosen. 1989. The Paracanthopterygii revisited: Order and disorder. Nat. Hist. Mus. Los Angeles Co. Sci. Ser. 32:5-36. Rosen, D. E. 1985. An essay on euteleostean classification. Am. Mus. Novit. 2827:1-57. Rosen, D. E. and C. Patterson. 1969. The structure and relationships of the paracanthopterygian fishes. Bull. Am. Mus. Nat. Hist. 141(3):361-474. Stiassny, M. L. J. (1986) The limits and relationships of the acanthomorph fishes. J. Zool. London (B) 1:411-460. Stiassny, M. L. J., and J. A. Moore. (1992) A review of the pelvic girdle of acanthomorph fishes, with comments on hypotheses of acanthomorph interrelationships. Zool J. Linn.Soc. London 104, 209-242. My... What Big Eyes You Have!